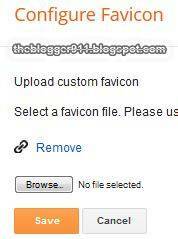 Now can Blogger in Draft users to add a custom favicon for their blogs from the Design | Page Elements tab, by clicking Edit on the new "Favicon" setting above the navbar element. that Blogger in Draft users can now add a customized favicon to their blog. Login to your Blogger in Draft account and go to the Design --> Page Elements. Now click "Edit" on the new "Favicon" setting above the navbar element. A new window will then open where you can select an image from your hard drive to replace the default favicon image. After uploading the images, click on "save".